SOUNDCAST 4X4 (+1) has become one of the records I listen to often towards the end of the day. It is an edit (a little over an hour) of a four hour continuous electroacoustic improvisation in the Sculpture Room of the Crawford Municipal Art Gallery in Cork. 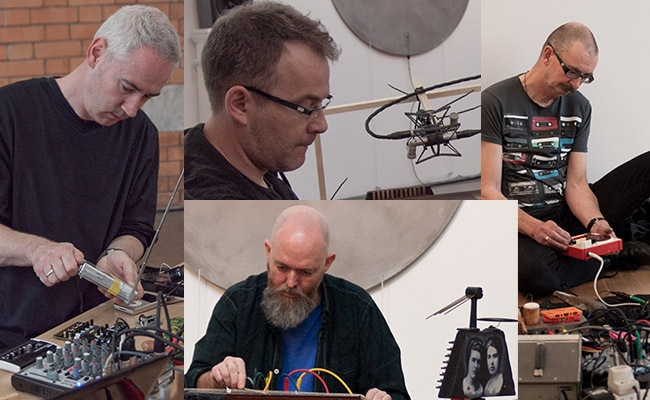 The performers themselves call it Sound Art, but if you are a lover of experimental music and free improvisation, please don’t let this scare you or put you off. Underneath the “marketing label”, you will find some of the finest free improvised music. The CD comes in an unusual fold-up package designed by Doreen Kennedy with photos by Irene Murphy and texts by Peter Murray (Director and Curator of the Crawford Gallery) and Francis Halsall (Teacher at the National College of Art and Design). Between them, they use an almost unbelievable variety of Instruments and NotInstruments. The packaging does not reveal who plays what, and listening to the music, it is really quite unimportant. I have seen several of their performances, and even experiencing them live, it absolutely does not matter which one of them makes any particular sounds. The music seems to create its own space beyond personalities and conventions. Improvised music is mainly rooted in two different traditions: Jazz and Sonic Sculpture. Soundcast has most definitely nothing to do with Jazz. The inspiration behind the sound is clearly visual. Complex textures evolve and shift, and listening at different times, different figures become visible audible against this backdrop. It’s the perception of Figure and Ground, interpreted as music. Hearing which of the performers contributes which of the elements of the overall picture sound at any one time is quite impossible, and it helps to “just listen” and not get side tracked into critical analysis of irrelevant matters such as stage presence and lighting. Soundcast is a very quiet record with a meditational quality, strangely haunting, drifting in and out of focus… with the odd “surprise” here and there, but nothing truly startling or breaking the flow. The feeling conveyed is not unlike what came out of the Free Music scene of the 1970s, but the details of delivery and presentation are very different. However, there is no cover information – Irene Murphy’s photos are the only clue to what is happening: Anthony Kelly, Mick O’Shea, and David Stalling perform while they are seated at long tables. This has become a standard practice in live performance of electroacoustic music. The tables are loaded with electronic devices and home made or customized instruments, and all sorts of small percussion. Danny McCarthy is different. He performs squatting on the floor, with his instruments spread out on a cloth in front of him – giving the visual impression of a street trader selling trinkets off a blanket. His sonic arsenal is dominated by musical toys and toy instruments. I highly recommend this CD if you like experimental music of the quiet kind and free improvisation. It is available at the PLUGD shop in the Triskel Arts Centre and in the Crawford Gallery shop, or directly from Farpoint Recordings. This entry was posted in My Sticky Opinions, Other Soundworks In Cork. Bookmark the permalink. Performances by any of these musicians are definitely not to be missed. There is nothing quite like being in an acoustic space with these sounds, seeing the manifold gestures that create them, and witnessing the quiet sonic investigations taking place. But if you don’t live in Ireland this CD will do as a quick substitute! It’s only disappointing when it has to end. And a great description of Danny, by the way. Thanks for your comment, Robin, and also for your comment on Facebook. It is certainly true: seeing them making the sounds in the space is an experience way beyond what the CD can convey. But the CD does have an advantage: I can immerse myself completely, at any time I wish. It really is the kind of music which makes me want to do that. The best composition pgroram I have come across that enables you to pgroram instruments via MIDI and loop custom drum beats is FL Studio. I use the producer edition, but that may be a bit out of most people’s price range if you can get around that somehow, go for it.